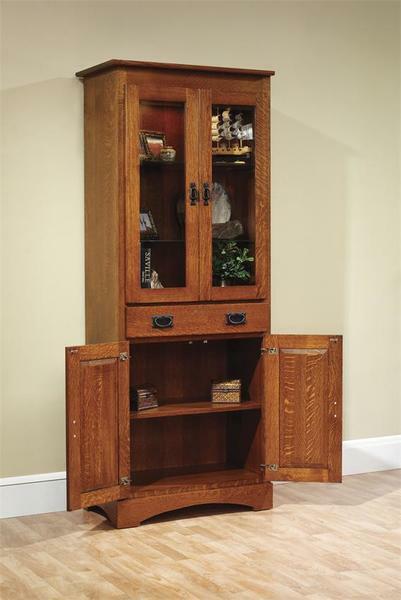 The Amish Old English Mission 30" Bookcase with Doors is a mission style bookcase that fits right in with your office furniture or solid wood living room furniture. This custom made bookcase provides spacious, adjustable shelves to hold your collection of books or treasured keepsakes. The simple beauty of mission style furniture never loses its appeal and has remained a customer favorite throughout the years. The beauty, strength, and function of mission furniture never goes out of style. This mission bookcase can be passed on for family members to enjoy for years to come. The Old English Mission Bookcase is shown here in quarter sawn white oak wood with Michael's finish. Quarter sawn white oak wood is known for its amazing strength and firm texture. Customize this Amish made furniture with your choice of wood and stain. 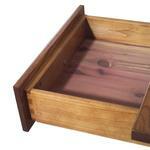 Add soft close drawers or cedar bottoms that fill the room with a lovely scent. Touch lighting is also available for this solid wood bookcase. Please call one of our Amish Furniture Specialists at 866-272-6773 with any questions.